Alex Ponca Stock, an artist from the Osage Nation, works passionately on a mural that captures her culture through the eyes of its youngest generation. As you walk into the studio of nationally acclaimed artists Wendy Ponca and Alex Ponca Stock, you immediately sense the pride and passion the two pour into their works of art. The mother/daughter duo was recently commissioned to create a series of four large, five-foot-by-eight-foot canvas murals that will be displayed in the Wah-Zha-Zhi Early Learning Academies (WELA) and immersion school within the Osage Nation in Oklahoma. The project is part of the Osage’s ongoing efforts to celebrate and preserve their culture and history. Each mural will be instrumental in telling the Nation’s story for decades to come. The students participated in the creation of each canvas, which includes each of their portraits. The artwork also weaves in significant orthography and images symbolic to the Osage culture and each of the districts within the Nation. “Right now, when the children enter into the school, they see themselves and their friends in the mural,” said Melvina Prather, Director of WELA for the Osage Nation. As the children grow and evolve, so will the meaning of the murals. Representatives of TransCanada’s Indigenous Relations team learned about this artwork and its meaning in person during a recent visit to the rolling prairies of Pawhuska, Oklahoma, the heart of the Osage Nation. 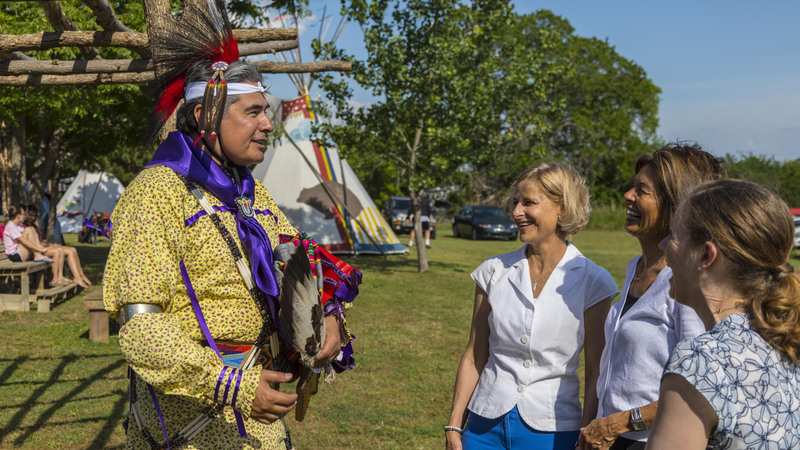 The team toured the community with representatives from Osage and saw firsthand the cultural programs the Nation has implemented with support from a project community agreement between TransCanada and the Osage Nation. “Seeing the community agreement in action during our recent visit was exciting,” said Nadine Busmann, Sr. Manager, Indigenous Relations for Governance and the U.S.
Support for sharing the knowledge of the Nation’s Elders and preserving the history and language for future generations is important to the Chief and to the community. “We found that the teachings from our Elders were spot on. You must have a strong language, you must have a strong culture, and you must have land that you claim as your own. Those are the three pillars upon which we build our culture or society,” said Chief Geoffrey Standing Bear, adding that cultural preservation is critical to defining his people, the Wah-Zha-Zhi (the Osage) who live northwest of Tulsa. In 2008, the Osage Nation became the first U.S. Tribal group to partner with TransCanada as we began consultation on the Keystone Pipeline System, which has now safely transported energy for over six years. Since then, we have continued to collaborate with the Osage on initiatives such as the cultural preservation programs. A series of four, four-foot by eight-foot, canvas murals capturing the Osage culture through the eyes of its youngest generation will be on display in local early childhood academies and in a language immersion school. This program encourages youth to learn about the Osage history through the distribution of 'craft packs.' Each pack includes a coloring sheet, puzzle and interactive guide on the Osage Nation Museum. Eight traveling trunks filled with Osage artifacts and art provide a tactile experience for youth to immerse themselves in Osage culture. These programs emphasize the importance of early childhood reading and literacy, and are implemented in schools and medical clinics. Children who participate in a Reach Out and Read program get a three- to six-month reading advantage.